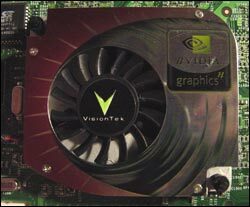 Visiontek once again is the first GeForce4 card onto the shelves. Visiontek has been dominating the video card market recently, and seems to be only getting better for them as other companies have dropped out of the NVIDIA graphic card market lately. This is allowing Visiontek to take more and more of the market, looks like their decision to bring the video card line out of just OEM and into retail was a smart choice. Another smart decision in my opinion was their choice of names for their cards this time around with the GeForce4 line. In the previous generation, the GeForce3 Titanium series, Visiontek had names like the Visiontek Xtasy 6964…try and guess which card that is (it's the GeForce3 Ti500 by the way). While they did keep their Xtasy line in-tact, the card's name is now just the chip from NVIDIA that they are using. This brings us to the beginning of our review. The VIVO cable allows you to not only output your video onto something like a TV, but also input your video from any kind of S-Video device. This means that the Ti4600 from Visiontek is essentially a video capture device at the same time. We'll get more into this though in the board overview section of the review. As Visiontek has done in the past, they pretty much give you the barebones in order to pass on savings to the consumer. They include a quick installation guide on paper, but there is a more detailed guide and video on the CD that is included. They have also bundled Cyberlink's PowerDVD and PowerDirector, but no games. PowerDVD is obviously a DVD player while PowerDirector is a video editing tool since the card does do video capturing. 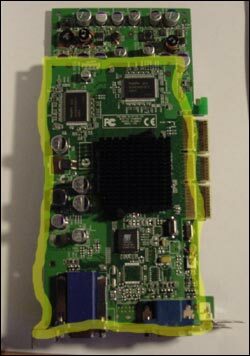 In fact because of it's size we had some issues putting the video card into our motherboard because there was an audio input in the way on an Intel D850MD. I just pushed it down a little bit and the issue was solved. I remember reading over at HardOCP something about the issue and that Visiontek had moved some capacitors around in order to clear up some of the problems. I'm not 100% sure about this though as it's something I just remember reading a while ago. If anybody can clear this up I will post an update to the review. The other thing major thing I noticed was the cool looking heatsink from NVIDIA. Visiontek chose to go with NVIDIA's heatsink rather then making and testing their own, this also ends up saving costs for the consumer because they don't need to spend any money on R&D. Under the heatsink is the 300MHz GPU which is manufactured using a 0.15 micron technology. Note that the card gets very hot. 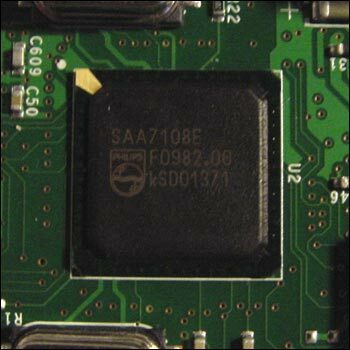 In terms of memory there are 8 chips, 4 on each side of the card. 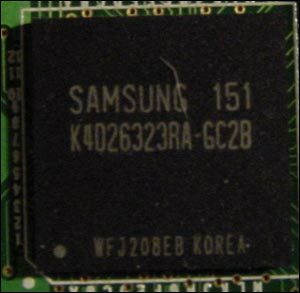 Each of the chips are 2.8ns 16MB and made by Samsung. The default clock is set at 650MHz which means that this is the first consumer card to break the 10GB memory bandwidth barrier. Also note that the memory chips do not have heatsinks on them like previous generations of NVIDIA cards. 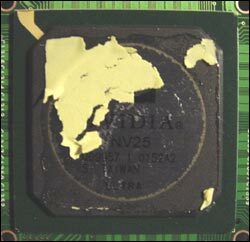 The reason is because of the difference between QFP memory (GeForce2/3) and BPA (GeForce4) memory. 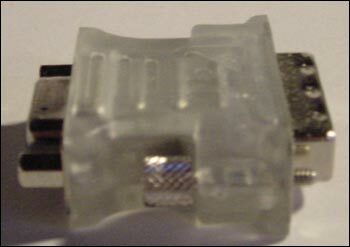 This chip allows the Xtasy Ti4600 to do the video-in/video-out with the VIVO cable I spoke about earlier. This brings me to my next point, the card offers the NVIDIA Personal Cinema support we talked about in our Xtasy Everything review we did a while back. Although note that the card does not work with the Personal Cinema's breakout box, which means there are no TV-Tuner capabilities. We were told that Visiontek was looking at doing an NV25 or NV17 based Xtasy Everything based on the Personal Cinema this year. Something new that you will notice on the card is multi-monitor support, aka nView. Like ATI's Hydravision technology, nView is very similar in terms of how it is used, in fact, it's made by the same company. I personally think that nView is even easier to use then Hydravision. Just a quick note, this adapter comes with Radeon video cards...Visiontek does not include it. So if you need one you'll have to pay extra, even though they are fairly cheap. Here we see the GeForce4 Ti4x00 series sweep everything by far. The Ti4600 and Ti4400 ran pretty close to each other. Keep in mind that the Ti4400 retails $100 less then the Ti4600. In terms of the previous generation comparison, the Ti4600 runs about 20-25% faster then the GeForce3 Ti500 and about 33% faster then the GeForce3 at 1600x1200. In comparison to ATI, at 1600x1200 the Ti4600 was about 22% faster, but keep in mind we benchmarked the 64MB flavor of the card, not the 128MB which was recently announced. As Quake3 becomes an older benchmark, we're seeing that at lower settings with lower resolutions almost everything peforms very similar, that's why I'm going to pretty much look at the high quality 1600x1200 benchmarks since these really show where things start to differentiate between all of the cards. Once again the the Ti440 is performing less then 10% below the Ti4600, everything else is in pretty much the same sort of range within about 4% or so from the 3DMark scores. This is a new benchmark that we've added to test cards with. XPBench is specifically designed to query which Windows XP feautures your video card/driver combination supports, and then demonstrate the performance improvements and level of support for the features of the Windows XP GUI. We can see here that the Ti4600 really dominates everything. Note the ATI cards which are much lower then any NVIDIA card, looks like ATI needs some work on their Windows XP drivers. The results for the Evolva test are pretty surprising as the Radeon 8500 gets a big boost and performs up there with the big guys, only 5% shy of the Ti4600 and about 6.5% better then the GeForce3 Ti500 in the bumpmapped test. The Ti4400 performs only 2% slower then the Ti4600, a difference that we doubt you could tell.